The scenes are simple: Steve Griffith playing catch with his son, Lewis. Boris Govzman doing card tricks for his grandsons, Daniel and Jonathan Tyshler. 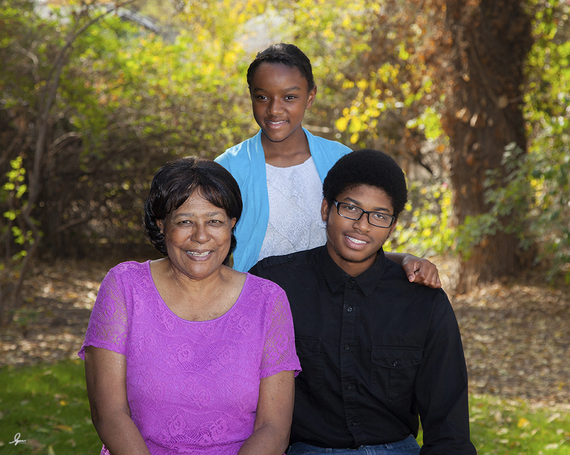 Irene Sample sprinkling wisdom on her great-grandkids, Eunique and Darian Latchison. In so many ways, these adults helped shape the lives of these youngsters. And, in return, these youngsters helped save the lives of these adults. Lewis, Daniel, Jonathan, Eunique and Darian are all 16 or younger, all learned CPR, and all had the presence of mind and composure to use it on someone they love. On Jan. 2, these kids and their families will be bonded by another unique experience. 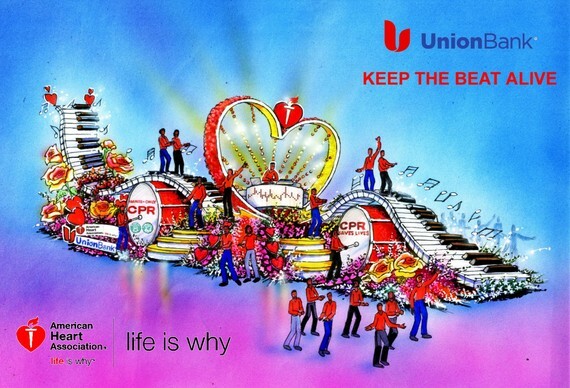 They'll be among the CPR heroes riding in the 2017 Rose Parade as part of an American Heart Association float sponsored by Union Bank. The AHA float debuted this past New Year's Day and was such a success that we're doing it again. In honor of California recently mandating students learn CPR to graduate high school, the theme is "Keep the Beat Alive." It's worth noting that a total of 34 states plus the District of Columbia have passed laws or changed their curriculum to making such training a graduation requirement. We look forward to the day when every state teaches CPR in schools because it really does make a difference, as these stories illustrate. Push hard and fast in the center of their chest, preferably to the beat of the classic disco song "Stayin' Alive" until help arrives. On behalf of the American Heart Association, I wish you the happiest of holidays and a healthy 2017. One scorching hot afternoon in August 2014, Steve Griffith climbed down from his roof, went into the kitchen and told his wife, Elizabeth, he didn't feel well. They decided to go to the doctor's office and Steve began to get ready. He didn't get far. Steve collapsed in the kitchen, the noise jarring his 13-year-old son Lewis, who was watching TV in the nearby living room. Elizabeth had gone outside, so Lewis ran to tell her what happened and to call 911. The dispatcher told Elizabeth that help was on the way and asked if anyone there could do CPR. "I can do that," Lewis said. Lewis hadn't told his parents he'd learned Hands-Only CPR during a health class. He spent about 6 minutes giving compressions until first responders arrived. 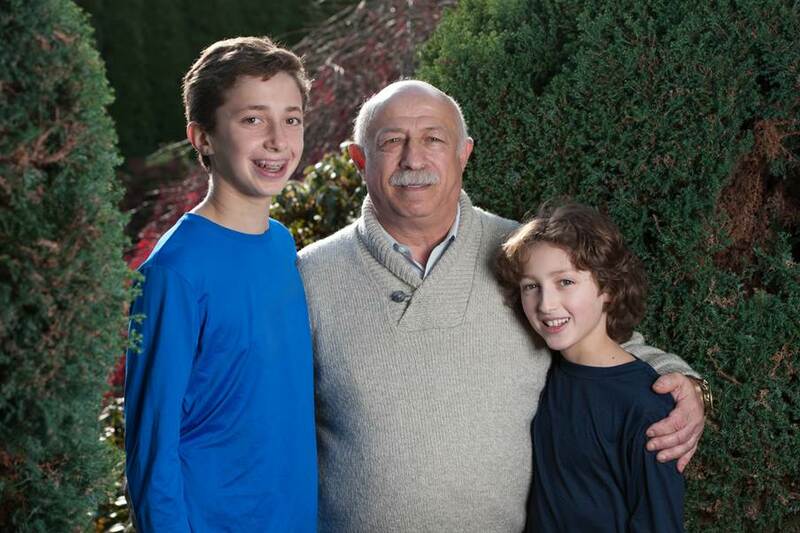 Steve's cardiac arrest was triggered by a buildup of plaque in his heart. He was 64, yet also fit and followed a healthy lifestyle. Doctors credit that for how long it took for the problem to manifest. Long enough, it turns out, for Lewis to have attended that health class. "I'm unbelievably fortunate," Steve said. "I try to hold onto that gratitude and to recognize that Lewis is the main hero and that the entire chain of events went in my favor, right down to living at a time when all these medical procedures are available." Whether Steve and Lewis are playing baseball, or the entire family (including Lewis' sister, Ella) is picking out and decorating their Christmas tree, time spent together is extra meaningful. 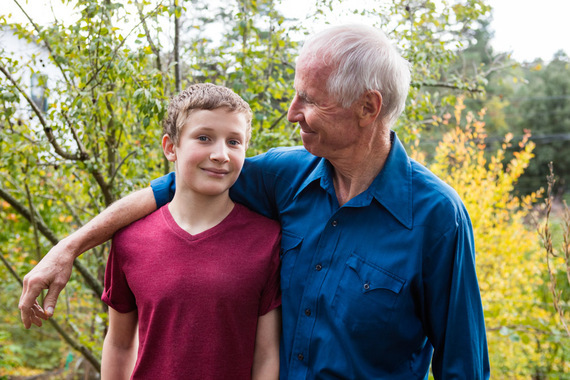 It can be challenging, too, though -- such as needing to remind a teenager to do his homework or take out the trash when that teen recently saved your life. "I have to remember that I was brought back not just for myself, but to still be his dad and everything that means," Steve said. For instance, Steve is teaching Lewis the importance of paying it forward. They've used their story to encourage lawmakers to support the CPR in schools bill and to spread awareness of Hands-Only CPR. "CPR is so easy to learn," Lewis said. "Everyone should do it." Larisa Govzman wanted to celebrate her 70th birthday by going on a vacation with her grandsons. So in August, she and her husband, Boris, took 13-year-old Daniel and 11-year-old Jonathan Tyshler to Southern California. Their weeklong trip went great. Until the ride to the airport to fly home. Boris was driving a rental car in the carpool lane of Interstate 405 at 9:20 a.m. on a Tuesday when he went into cardiac arrest. The car veered right across seven lanes of the usually congested freeway, through a patch of trees and somehow came to a safe stop. Larisa cut the engine and she and the boys got out. Daniel called 911 while Larisa, Jonathan and a bystander pulled out Boris. Then Daniel handed the phone to the bystander and began giving chest compressions. "I guess it sort of came to me," said Daniel, who'd learned the skill in a seventh-grade health class. "I just started doing it." Jonathan helped, too. About eight months before, he practiced giving compressions on a manikin at a health fair. Plus, he adds, "our mom is a doctor and I remembered what she told us to do in a critical situation like that." Once help arrived, it took two shocks from an automated external defibrillator (AED) to revive Boris. He spent a week in a medically induced coma. Two days later, the family feared he may never wake up. Then Boris squeezed Jonathan's arm. The following week, everyone knew Boris was headed to a strong recovery when he plucked a deck of cards from his physical therapist's pocket without her realizing it, then performed a trick in which he blindly drew a card the woman had selected and shuffled back into the deck. "It was really funny," Jonathan said. Doctors never determined the cause of Boris' cardiac arrest, but he went home with a defibrillator implanted in his chest to help keep it from happening again. Now they're headed back to Southern California for New Year's -- which, for this family of Russian immigrants, happens to be their biggest annual celebration, one they fill with song and dance ... sort of like the Rose Parade itself. "I think it's kind of symbolic," said Leanna Tyshler, the boys' mom and the daughter of Boris and Larisa. Of course, there will be time for introspection, too. The prevailing theme is likely to be something Larisa mentioned at the first family gathering after they all returned to Seattle: Never miss an opportunity to express love for one another. "I thought," she said, "I may never get to say that to Boris again." Irene Sample began raising a granddaughter's children about 20 years ago. She was living in San Jose when she took in the first two. She took in two more after moving to Bakersfield. Then she took in another, a 1-week-old named Eunique. Although Irene is their great-grandmother, the kids call her Grandma. Except Eunique. She sometimes calls her Mom. In July 2015, Eunique was in a summer reading program and needed some books from school. It was a hot day -- the temperature reached 107 -- so one of Irene's daughters gave them a ride. The daughter also was supposed to drive them home. However, she went to her own home to take some medicine, then laid down to rest. Realizing they were stranded, 74-year-old Irene and 11-year-old Eunique began the 10-minute walk home, along with a pile of books, as Irene had picked up extras for the girl's classmates. Upon feeling the cool air inside the house, Irene asked Eunique to bring her a glass of water. When she returned, Irene was slumped over on the couch. She had no pulse. Eunique called 911 and woke her brother, Darian. He gave chest compressions until help arrived. "My arms felt weak, they felt like noodles," Darian said. "Me pushing down as hard as I can, I was just unsure." And afraid. As he pressed on her chest, he said: "You can't leave us, Grandma! You've got to see us graduate!" How did the kids know what to do? That's perhaps the best part. Irene used to be a foster parent. She gave it up once she started raising her great-grandchildren in Bakersfield, but maintained her certification. That included CPR training. She brought Darian and Eunique once they were old enough to understand. "I remember telling them one time: `What if something would happen to me here in the house? What would you do?'" Irene said. Irene suffered a heat stroke. Doctors said her heart stopped at least twice. She was hospitalized for about a month. She's doing well now, her spirits further lifted by using their story to inspire others. She's especially proud that the AHA and Union Bank are sending CPR training kits to Ridgeview High School; soon, their neighborhood will have even more lifesavers. As they look forward to the parade, there's one more big celebration: Eunique turns 13 on Christmas.